I’m sure sure some of you are familiar with that idiom — or, “The proof of the pudding is in the eating,” as they say in the U.K.! Generally, the saying is attributed to Miguel de Cervantes translation of Don Quixote, written in 1615, “al freir de los huevos lo vera,” (“you will see it when you try to fry the eggs”)! Only a writer would find that amusing! Regardless of which idiom you are familiar with, the meaning is the same; the end result is the mark of whether something is a success or failure. 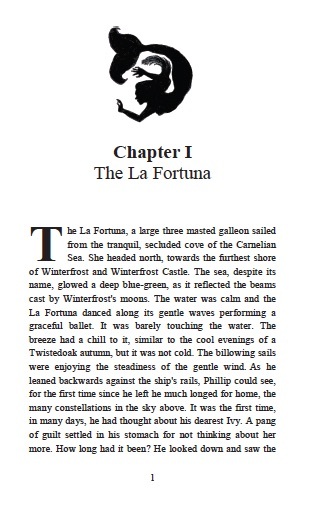 And so, the PROOF of Phillip’s Quest, Book III: Across the Elusive Sea is done, it looks amazing. The story is exciting, and action packed. Phillip and Dreamspinner are on their way to Winterfrost with a crew of elven pirates, and I couldn’t be more pleased! Eating the PUDDING, my friends, is up to you! This third adventure will be released in time for the holidays — prior to Thanksgiving — so I hope you will add it to your favorite child’s reading library. That’s really the only way I know whether I did a good job! Of course, all three Phillip’s Quest books are available on your favorite on-line book seller, as are the two Ragwort Chronicles! So, there you are — chocolate or vanilla? Enjoy! Order Your Pre-Release Copy — Phillip’s Quest, Book III: Across the Elusive Sea! 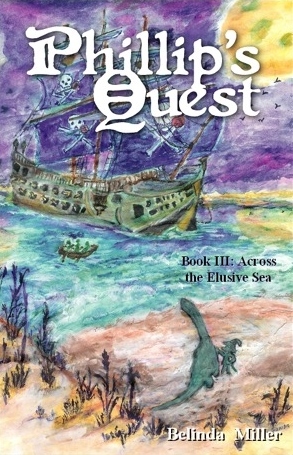 As of September 1, 2015, a signed copy of Phillip’s Quest, Book III: Across the Elusive Sea will be ready for you at the pre-release price of $17.50 plus $3.00 s&h. The 156 page continuing adventure of Phillip and his companions is filled with new and exquisite illustrations, recipes and characters! You will meet pirates, Nestors, Neveans and Kala — the beautiful mermaid from the kingdom of Cerulea. 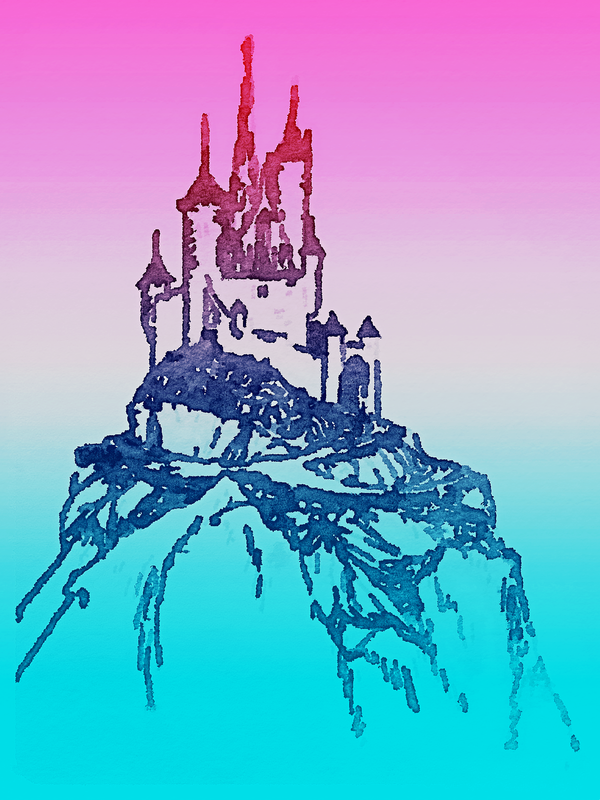 You will find out about the magic of Winterfrost Castle and the fate of Phallow, Phillip’s brother. This book will not be available for sale, anywhere except here, until November, 2015! Once it is released, it will not be discounted. 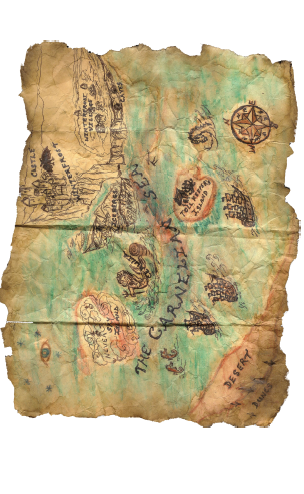 Below, is an example of one of the maps and pages of this extraordinary adventure of Phillip’s Quest. You may read an excerpt from the book at the “Across the Elusive Sea,” page on this site. If you would like to order this please leave your email address in the space available on the “Across the Elusive Sea” page. Thank you so very much! Live and in Color! Preorder “Above the Stars” on KICKSTARTER, NOW! Boots and britches! I am excited to announce that Book II of Phillip’s Quest: Above the Stars is available for pre-order on KICKSTARTER, today! THANK YOU to everyone who has supported Phillip and myself on this journey to publication. Phillip’s Quest is a series of beautifully illustrated Middle Grade books of the tale of an ordinary garden gnome, Phillip Tuber, on an extraordinary quest and is the inspiration of Tolkien’s Middle Earth and Lewis’s Narnia. You can preorder your copy of Above the Stars on the KICKSTARTER site, until September 30–but, if you want to give Phillip, the book, and me a SPECIAL boost, please consider buying your copy today, on launch day, and help build an early momentum. And remember, if I do not reach my goal, I do not get one dime! All you have to do, to get to my KICKSTARTER page is click on the picture or the links embedded at the end of each paragraph! In addition to the books, there are all kinds of great perks available at the campaign. They range from the original artwork of Dean Kuhta and Louise Goodchild to my own jewelry and an Italian dinner for four! Please check out the campaign for more details. Again, many thanks for your support. I will be back in touch with campaign updates throughout the month of September! Ciao, grazie. PS – In case you’ve never visited KICKSTARTER before, or you don’t even know what it is, I’ve attached a little example that shows how to order something there. It’s a few easy steps. KICKSTARTER is the largest crowd funding platform in the world, having raised over $1Bn for creative projects like Above the Stars. They process payments through Amazon, the largest retailer in the world. So, preordering Above the Stars on KICKSTARTER is a snap! He was chomping on a long blade of grass. This odd looking fellow wore no boots on his very furry feet. He was the herder of the spotted goats. The goat herder had a few of the silly goats lagging behind. He seemed completely unaware of the dinosaur beside him or the gnome standing on top. Edward had managed to scramble to the top of Stinky’s head where he perched himself so he could get a better view of the activities. “Lassies, p-p-please now. Yur a-laggin’ b-b-behind. It’s almos t-t-time fer t-t-tay.” As he spoke, there were little sprays of liquid coming from his mouth. Indeed, he spit as he spoke. This odd fellow plus many more make their appearance in the newest book of the Phillip’s Quest series as Phillip and his two companions, Edward the Squirrel and Stinky the Dinosaur, continue on their quest for Winterfrost Castle. Meet Bael, the Red Witch’s new villain who tries to straighten out Razorsnoot, the farting goblin. Meet Oli, Edward’s sister who is taking care of a special gnome. And meet Chaspere, the lizard who’s a wizard! Look for the “Above the Stars” Kickstarter Campaign beginning in September, so that Llamont, Llemura and their silly, spotted goats can leave Ice Cave Canyon for the pages of “Phillip’s Quest, Book II.” Win free prizes–jewelry, art prints, gift cards, free signed copies of “Winterfrost” and “The Ragwort Chronicles,” and MORE. Sign up for the “Gnome Gnews-Letter” at this website for updates about the campaign, new books and exciting offers! Above the Stars, the continuation of Phillip’s Quest for Winterfrost begins as the three companions arrive in the land of Winterfrost, a land of “unbelievable beauty and incredible cold.” A book as beautiful as WInterfrost, this book is filled with new and old characters alike. Meet Phillip’s new friends, Llemura and Llamont; new enemies, Bael and a new wizard and the unicorn, Chaspère and Unilda. Find out what happens to the companions and their beloved Twistedoak as they continue their epic saga. Will they get through this challenging journey together? Above the Stars is written by Belinda MIller and has the beautiful illustrations of Dean Kuhta. A fantasy of words and pictures. Above the Stars will be available for sale in book and ebook format, late October, 2014 through Amazon.com.